April 12, 2019 | 3:30 p.m.
An illustration depicts Sputnik 4 orbiting Earth. Humankind never fails to succeed in producing trash. Lands are littered, oceans are awash with rubbish and the atmosphere is filled with fumes on a daily basis. And this propensity toward pollution is extending beyond Earth's confines. At this moment, there are hundreds of thousands pieces of space junk orbiting the planet. Some of that detritus was originally sent into space with a purpose, like non-functional spacecraft and fragments of what used to be operational satellites. Other debris includes abandoned equipment and other waste dumped from crewed missions. Lisa Ruth Rand, who was a postdoctoral fellow in the Institute for Research in the Humanities at the University of Wisconsin-Madison, discussed what happens to stuff left in space in a June 12, 2018 presentation recorded for Wisconsin Public Television’s University Place. NASA and the U.S. Department of Defense track debris in space on a regular basis. This surveillance focuses on the risks of active spacecraft colliding with such orbital trash. Despite a massive amount of space junk floating around, there have been "surprisingly few disastrous collisions," according to the space agency. The first piece of space junk came from Sputnik, the first artificial satellite, launched by the Soviet Union in 1957. The probe itself wasn't visible, despite Cold War lore about people heading outside and spotting it in the heavens, Rand said. It was really the rocket used to boost Sputnik into orbit that was visible from the Earth's surface, thanks to efforts by Soviet engineers to make it more reflective. 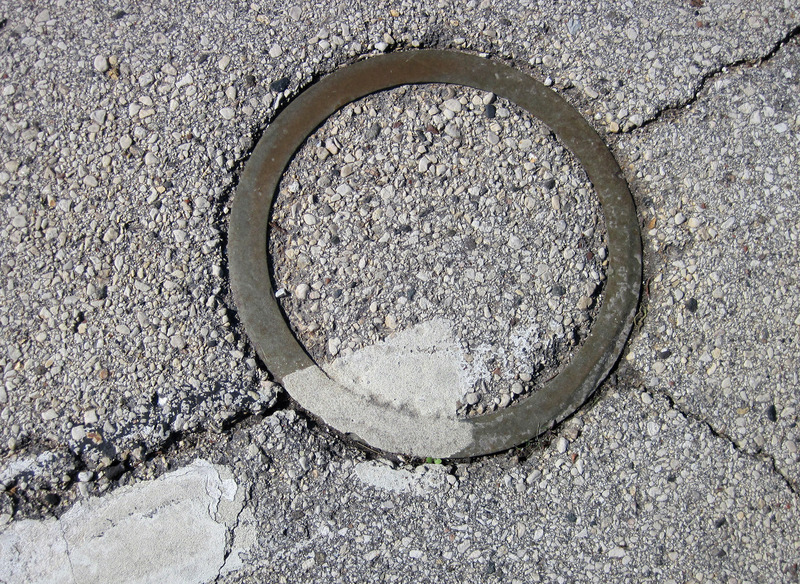 A metal ring embedded in N. 8th St. (U.S. Hwy. 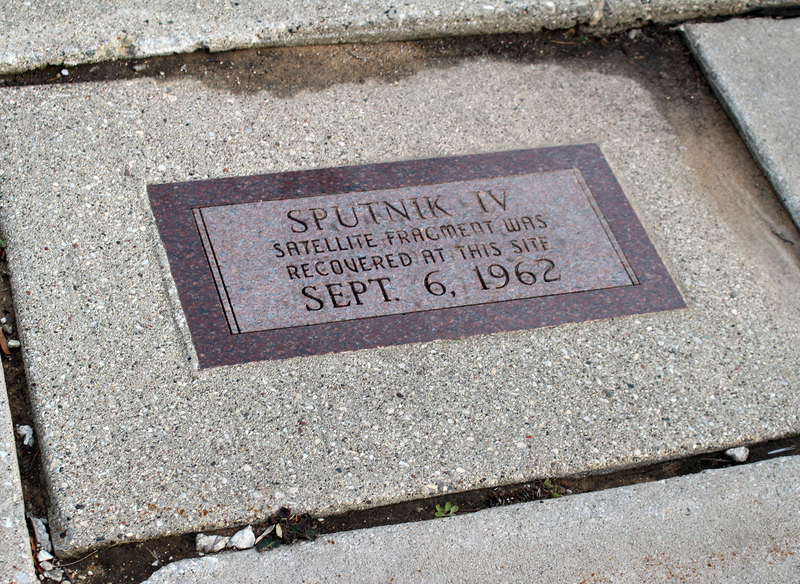 10) marks the impact site of a fragment of Sputnik 4 (also called Korabl-Sputnik 1) in Manitowoc. It's Sputnik 4, launched in 1960, that holds a special place in Wisconsin's heart, though. Rand detailed how a fragment from the Soviet spacecraft crashed onto North 8th St. in Manitowoc in September 1962. After some diplomatic wrangling over this unusual international incident, the satellite fragment was eventually returned to the U.S.S.R.
All that remains of Sputnik 4 in Wisconsin is a small brass ring embedded in the road at the spot of impact, a commemorative plaque, and a replica of the fragment has been on display at the city's Rahr-West Art Museum. A plaque on the sidewalk next to N. 8th St. (U.S. Hwy. 10) in Manitowoc commemorates Sputnik 4's connection with the city. Manitowoc certainly hasn't forgotten this strange event. Over the past decade, the city has celebrated Sputnikfest every September to commemorate the crash. "It always draws kind of a feisty crowd," Rand said. "They have a reenactment of the event. They have green burgers. They have a Ms. Space Debris pageant. And people have a great time." Objects in orbit move very fast. Even small pieces of space debris can move at a rate of seven to eight kilometers per second, which has the potential to cause substantial damage to satellites and spacecraft. Accidental collisions between a spacecraft and debris have happened and there is an ongoing risk of more. In 2009, a privately-owned American satellite collided head on with a non-functioning Russian satellite, leaving large plumes of debris circling the Earth. Satellites are an integral component to 21st century civilization. The technology touches nearly every part of modern infrastructure — from weather forecasting and air travel to satellite radio and GPS. Satellite technology is heavily integrated into modern life whether it's noticed or not. If a satellite fails, the potential effects could be devastating. Space junk poses a potential threat to astronauts, and debris has caused damage to crewed spacecrafts in the past. In 2016, a piece of debris hit a window on the International Space Station. Though all astronauts aboard were unharmed, the small piece of waste left a sizable chip in a window. Following the Soviet launch of the first Sputnik satellite, scientists at the Massachusetts Institute of Technology came up with the idea to create an "artificial ionosphere" that could transmit radio signals from one point on the ground to another (in case of a devastating attack). They created tiny copper antennas, thinner than a human hair and launched about 400 million of them into space to form a ring around the planet, à la Saturn. The project saw success in 1963 when researchers on the East Coast were able to transmit a signal to others on the ground in California. These copper satellites weren't without controversy, though. Once details of the mission were made public, astronomers became vocally concerned, going as far as to testify on the floor of the United Nations saying that "no individual government had the right to take risks in outer space without consulting the international scientific community." Once a runner-up in Manitowoc's annual Ms. Space Debris contest, Rand also discussed the problems posed by space junk in an Oct. 10, 2017 interview on Wisconsin Public Radio's The Morning Show. A photo taken in November 2016 shows a 7 mm impact chip in a window on the Cuploa module of the International Space Station after being struck by a tiny piece of space debris. On the amount of human-made objects in space: "Right now, there's some 1,100 working satellites in orbit at the current moment. And the rest of the objects ... are non-functioning space junk. And as of April , there are a total of some 18,922 cataloged human-made orbiting objects tracked by the U.S. Space Surveillance Network. But the Orbital Debris Program Office run through NASA puts the total number of objects larger than 10 centimeters in orbit at around 21,000. And this doesn't include small debris — so particles between one and 10 centimeters in diameter — they estimated about 500,000 in orbit right now." On the potential for damage: "A piece of debris smaller than a half an inch around … traveling at about six miles per second could hit as hard as a bowling ball traveling at 300 miles per hour. So it could have a really devastating effect on functioning spacecraft, on spacecraft that we've spent millions or even billions of dollars sending up into space and want to protect." On why satellites fall out of the sky: "What goes up must come down — whether that happens over the course of weeks, months, or even millennia, everything that we put into orbit will eventually come back to Earth. Our atmosphere does a really wonderful job for us in exerting pressure and friction and heat on objects that reenter. Typically they break apart, dissipate in the atmosphere, and any pieces that do survive typically fall into the ocean." On what would happen if all current satellites fell from the sky: "If all the satellites were to fall out of the sky at once like they do in Gravity, it wouldn't be like the lights going off. It wouldn't be something we would see right away. We would almost feel it in our bodies that something was wrong. Things aren’t working the way that they're supposed to. Our calls get dropped. We can't navigate using our phones like we're accustomed to. We can't get money out of the ATM. ... The internet wouldn't be working quite right. Things would just stop functioning in a way that was completely invisible. And it would be pretty chaotic, I imagine, should such a scenario happen." On the solutions to minimize harm from falling space debris: "There's the idea of mitigation, which is creating less debris and letting the atmosphere and gravity and friction take care of our problem for us, which many of us think is a really wonderful, elegant solution to the problem. But then there's the idea of remediation or active removal. And that's something that's much sexier, particularly in America where we have our startups in Silicon Valley and we love to create new things." Space Trash: What Is It And Why Is It A Problem?